Not the album from "God" but some of the tracks are fantastic like Circus, River Of Tears and the best track on the album Born In Time. I much prefer Eric to just sing the songs and play like God rather than go for all that production crap we hear on so many records these days. Time" is splendid, "River of Tears" is a masterpiece. Thank you EC for this unforgettable album. The mixed styles of sounds has made a cool album, I like so much the track version of "Born in Time", In fact in 1998 born my son so, it remember me very good moments of my life. Anyway this is a great album! E.C. has been one of several guitar idols I have had for literally decades. So why am I so very disappointed with this release? It's not the great songs. It's certainly not his time-tested musicianship. It's the heavy-handed techno-antiseptic production that makes the already techno-slick 1986 "August" album sound downright primitive. Sorry Eric, but good songs deserve far better treatment from a musician of your calibre. It's hardly surprising that all the used CD stores carry this title in abundance. I'll be charitable and give it a 5. I think that this is the album that belong to my heart. "Born in time" is a fantastic ballad ," you were there", I can t explain it .Sorry Mr. Clapton and all the fans , but I can write so well this language because I'm from Argentina, but I'll like to thanks all the fans for being fans and to the master Clapton for his music. Sir, your music knocked my heart and got into there. Thanks!!!!!! Few other artists that have been successful for as long his worship Mr. Clapton have come up with anything so different and original. Some dislike this album, but I think they are lacking eclecticism of taste. This album shows that EC is not just a blues-man, or a rock artist, but a musical genius; not constrained to a particular genre or style, even within the same album. River of Tears is a beautiful song, imbuing of lacerations indeed. Pilgrim is full of cunning riffs and musical blends and the whole album plays with one's emotions like only great music can. Different, original and brilliant. Another triumph from the God of Guitar. This is one of Clapton's career albums. It shows Clapton in a more nostalgic light than ever before. Many times you can feel how his life is going by his music. "My Fathers eyes" starts it out. Clapton at this time was regrets the fact he never had a Father. My Father eyes is one of hit songs from this CD and I'm sure you have probably heard it many times. Next is "River of tears" which haunts me. The guitar is Clapton as his very best. In my mind the best song on the CD and one of his all-time classics. He then goes to "Pilgrim" where he uses a falsetto which seems very out of place and out of character. "Broken Hearted" speaks to me. He uses a Leslie like he used on "Badge" which provides a nice sound. "Circus" is a leftover from the "Unplugged concert. The rest of the CD is good. The two songs that stand out for me are " Born in time" which Bob Dylan wrote and "You were there. An amazing album. One of the reasons why Eric Clapton is the best guitarist of all time is that he can do more then just play. He writes words that seem to blend perfectly with he guitar work. His intro riff to pilgrim is one of my favourite riffs of all time. This album is different then the rest of his work. In the album he's showing off his ability to bring aspects of his past and mix them together with new flavours and beats. Truly a work of art. What would we say about this album? I guess EC shows us a simply way to make up some great songs without prejudice of any kind. I think, I can feel his soul during the entire album. The songs repeatedly sends me back to different periods of my own life, and even to darker parts of it. Obviously EC is in a melancolic mood himself on this CD. This album is definitely one of my favorites. Though i can see that it's rather untraditional for an EC album, it has some strengths that are rare to this kind of music. Over all it's a very "polished" album, every sound is controlled to the max. And that may be the thing that some fans don't like. Personally I think it's a little strange to have a drum machine on the entire album, but on the other hand: The live versions of these tracks are fabulous. It's as if the tracks were written to truly stretch their legs at live concerts. So if you don't like the very clear sound of this album: Try and find some live material, it's great! This is the only Eric Clapton CD I own. I always listen to this CD on road trips and absolutely love some of these songs. I always find myself listening to the first 6 songs over and over again. Thank god for this album, it has also given me hope in my life. Just listen to the lyrics on Broken Hearted. Brilliant songwriting will always take the cake over fat riffs and solo's and I love the beats in this album.. I am a big Clapton fan but this record I can not get into except for a few interesting guitar solos. Mr Clapton should definitely leave the drum machine at home. From The Cradle being my all time favorite this being the follow up made it even harder to digest. Once again, one is not disappointed in Slowhand himself! Fantastic songs and sounds. River of Tears can leave your heart wrenching. This seminal and completely holistic album is a notable landmark in Clapton's repertoire. 'Pilgrim' is a polished blues odyssey produced as a result of a fruitful collaboration with co-writer Simon Climie providing his audience with the first album of original material since 'Journeyman' (1989). 'Pilgrim' remains punctuated with Eric's most endearing traits of consummate musicianship and humility, although the impassioned guitar solos of youth are balanced by his maturation as a singer/ songwriter and musician. There is a perfect integration of material from the evocative self-analysis offered in 'My Father's Eyes' and 'River of Tears' through to the masterful fusion of R&B and techno. sounds demonstrated in 'She's Gone'. Inevitably the cathartic emotional fluency which defines this album has lead to the venting of further more controversial issues such as anger and irony present in the Vaughan brothers influenced 'Sick and Tired'. 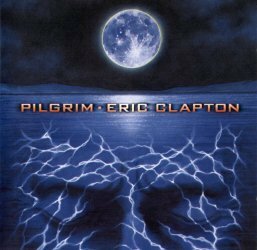 Perhaps it is the classicist poise contained in Clapton's live performances of 'Pilgrim' which best flatter it's melancholic genre. One of Clapton's ambitions in conceiving these tunes was to create extremely sad music, an objective he qualifies with a perceptive observation. For Eric, the special gift expressed within the sadness of blues is that it provides an affinity of feeling which relieves our isolation, (Guitar World, May 1998). It is with this sentiment that I owe a debt of gratitude to him in providing us with an intimate body of work which truly helped me through the 'Hard Times' of serious ill health. I would defy his critics who talk of resignation rather than the power of healing and renewal found throughout this album. One of Clapton's greatest successes is to have translated such tragic personal events within his life in to a universal spiritual language, which reassures listeners that his connection to the blues remains and entirely organic experience. Fans have revered Eric Clapton for decades as a deity behind the guitar. After seeing Eric perform this collection in person on his Pilgrim tour, I would be hard pressed to debate the analogy. Slowhand has not let us down with his album entitled Pilgrim. This album is packed with fourteen all original tracks, some will move your soul, and all will leave you wanting more. The music you will find here is fresh, clean, and crisp. It has a definitive beat that will continue tapping in the back of your mind all day. The lyrics; like the music, come from a deep passion for the blues. This bluesy contemporary ensemble is tribute to the ability of this artist to bring his fans to the appreciation of the roots of rock and roll without alienating neither a fan of the blues nor of rock and roll. This Eric Clapton fan continues to be in awe of the man many hail to be a God with a guitar.